The 235th birthday of American Independence. 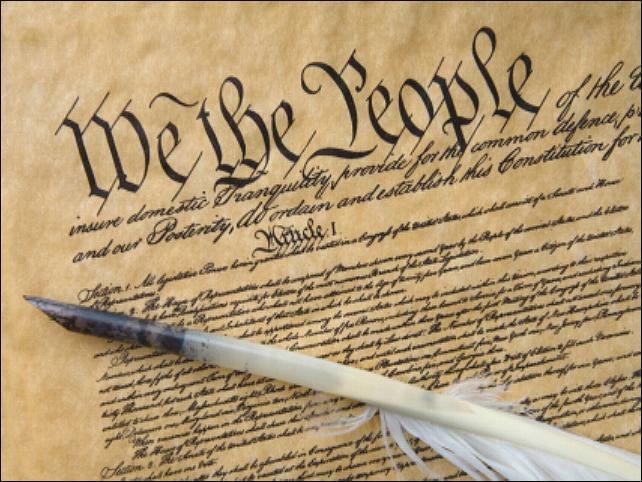 The recognition of human rights and freedom eventually led to the creation of America's Constitution that was signed into law September 17, 1787. "We the people of the United States, in order to form a more perfect union, establish justice, insure domestic tranquility, provide for the common defense, promote the general welfare, and secure the blessings of liberty to ourselves and our posterity, do ordain and establish this Constitution for the United States of America." George Washington said, "The power under the Constitution will always be in the people. It is entrusted for certain defined purposes, and for a certain limited period, to representatives of their own choosing; and whenever it is executed contrary to their interest, or not agreeable to their wishes, their servants can and undoubtedly will be recalled." And Thomas Jefferson added, "On every question of construction, let us carry ourselves back to the time when the Constitution was adopted, recollect the spirit manifested in the debates, and instead of trying what meaning may be squeezed out of the text, or invented against it, conform to the probable one in which it was passed." his year our involvement with the annual Fourth of July festivities amount to donating our truck and trailer for a Tea Party Patriot float in Grass Valley's parade. Ironically, years ago Mel's father donated his truck many times for parade floats in Nevada City. And so...early morning on the Fourth we find the participants putting on the finishing touches...a small cannon perched on the front of the float, a carved eagle on the back, and whatever else needs attention. Everything's completed and we all head for down town Grass Valley. Those taking part in the parade line up on Main Street in front of the City Hall. Here's some photos they took while waiting for the parade to start. Mel and I head for the Safeway parking lot that is close to the Del Oro Theater on Mill Street where the Judges will sit to view those in the parade. That's the best place to be...and it'll be shady. We have a great place to take photos of the participants. To our left on the other side of the street is the band playing patriotic music. Nice to get here early and actually see a couple of old friends among hundreds of people. KNCO radio's Hollie Grimaldi Floresadio is the parades announcer. She did a great job. The judges are Judy Bagley, Doug Becker and Mark Vance. Mel's sharing their platform at left. It's just about 11 o'clock and the Grass Valley Town Crier announces the start of the Independence Day parade, followed by the Honor Guard, and an airplane fly-over by pilots Bob Hobert, Mike Kaul, Allen Krosner and Gary Rudolph roaring over our heads. ...And a beautiful rendition of the National Anthem by this young lady. The following floats and participants mostly speak for themselves. I haven't included everything because there were too many. I heard the announcer mention that there were around seventy entrees. But the photos will give an idea of all the wonderful people who made it possible. The Boy Scouts selling cool refreshments. The Sierra chapter of Blue Star Mothers of America. Our Tea Party Patriot float...with smoking cannon. ...And Cheryl and Sue. As they pause before the judges, former Marine Cheryl salutes. Don't you love these miniature horses? The horse below just finished putting it's front feet up on the back of the wagon. Another patriotic song brings the parade to an end. Later, the Union newspaper reported that: The Town Crier tied for the best entry for an organization. The parade float sponsored by the Nevada County Fairgrounds Foundation won sweepstakes award. Junior Sweepstakes - NEO. Mayors Award - Center for the Arts. Best Decorated Entry - In Concert Sierra. Best Marching Band - Lyman Gilmore Band. Best Organization - The Town Crier and the Celtic Society. It's been fun...and now we head across the street to Gary's Place for a cold thirst quencher. Grandpa Thomas Bone used to stop here for the same thing during the 1930s and '40s. I asked a few people if they remember the former name. No one seemed to know, but we met some interesting people during the process. We got a kick out of his funny helmet. The attractive white haired lady is from Germany. She visits her niece in Grass Valley every year for a few months. She said it's been cooler and raining too much in Germany now, and she was looking forward to a warm Grass Valley. They wanted us to join them at the Holbrook, but we bid them farewell and headed for Maria's to join the bunch. Jeff's from Wyoming where Mel's many relations live. Larry drove our pickup in the parade. Following a delicious lunch with wonderful people we went home to take a nap. Later, we couldn't turn down Margie and Tim's invitation to their BBQ. We missed them at the parade, looked forward to dinner and watching a movie with them. It's been a great day celebrating Independence Day with nice people who share our appreciation for what the founders of America, and all who gave their lives for freedom did for us.